Bonnie Doon Leisure Centre is closed until late October. In addition to regular maintenance, the facility will undergo key renovations. Bonnie Doon Community League members can normally swim for free at Bonnie Doon pool during community swims. It is our understanding that you will be able to swim for free during community swims at Hardisty Fitness & Leisure Centre during the shutdown in Bonnie Doon. We will confirm this as soon as possible. Community swims at Hardisty take place from 1:15 to 2:45 on Sundays during (September through June). Please bring your membership card. Bonnie Doon Leisure Centre patrons can still enjoy the nearby outdoor race track and tennis courts during the facility shutdown. From Tuesday, August 5 through Friday, August 8 the Green Shack Program at Bonnie Doon Park will operate from 10:00 am through to 6:00 pm. This coordinates with the Gallagher Park Green Shack closing during the week of Folk Fest. Green Shack is funded by the City of Edmonton and the Bonnie Doon Community League. Each family will be required to pay a Participation Deposit (post date a cheque Jan 15, 2015) $150.00). Each player also needs to pay a Uniform Deposit ( post date a cheque Jan 15, 2015) $75.00). U6 players are exempt. Registration fees are $250 for all players with the following exceptions: $165 for U6 players (born in 2009/10) and U8 players (born in 2007/08). All cheques are to be made out to E.S.E.S.A. Please visit the ESESA website for more information. Bonnie Doon Community League is seeking the help of an experienced graphic artist who would be willing to volunteer their time. We need help with posters, signage and a few other design projects. If you are interested, please contact communications@bonniedoon.ca. One of the benefits of being a member of Bonnie Doon Community League is free community swims! From June to September 2014, BDCL members can swim for free at these City outdoor pools at these times. Bring your BDCL membership card. Except for guaranteed hours at Queen Elizabeth Outdoor Pool, pools will close for inclement weather or temperatures forecast below 18° C. Leagues members are able to access the facility 15 minutes prior to the scheduled time. The City has a page with the outdoor pools' locations and other important information. Are your kids looking for some summer fun? Check out the Green Shack Playground Program in Bonnie Doon. The program gives kids between the ages of six and twelve a chance to join in games, sports, crafts, music, drama and special events. Children under the age of six are welcome as well but must be supervised by a parent or guardian at all times. The Green Shack operates from 2:30 pm to 6:00 pm, Monday to Friday. The program runs until August 22. The Green Shack Playground Program is free, paid for by the City and the BDCL. Programming is still available on rainy days (check the rink shack) but will be cancelled during severely inclement weather. For complete neighbourhood Green Shack listings, please refer to the 2014 Community Summer Drop-in Programs guide: call 311 or visit HERE. The Galerie Cité has an exciting new exhibit highlighting the history and cultural heritage of Bonnie Doon. The exhibit features portrait and landscape paintings, all based on historical images and photos from the area. The artwork tells the story of the changes to the neighbourhood and the people who live(d) here. This is truly a community exhibit. The artwork was created by participants who took part in workshops led by Dawn Saunders Dahl and Rachelle Bugeaud this past spring. The exhibit is part of a project created by Dawn and Rachelle to provide unique opportunities to explore the history and cultural heritage of the greater Bonnie Doon area through the visual arts. The project will run until December, 2014. 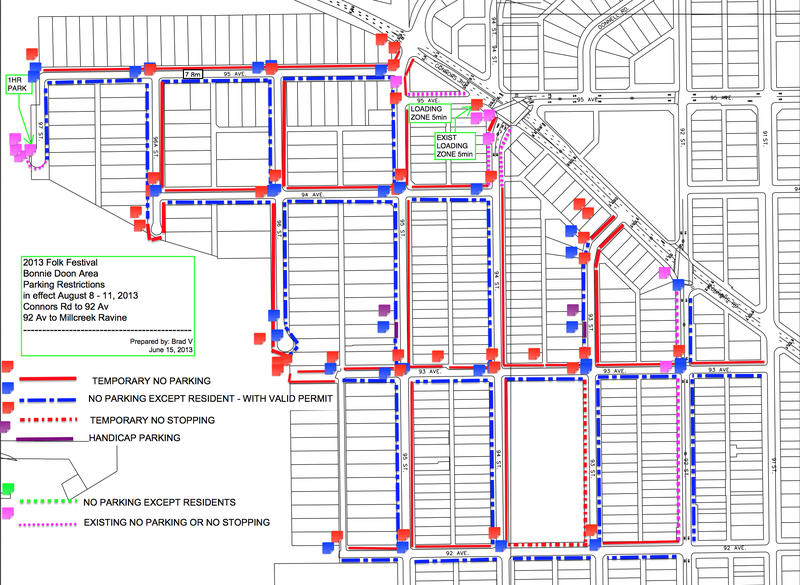 For the second year, the City of Edmonton will be implement parking restrictions for a portion of Bonnie Doon during the Edmonton Folk Music Festival, August 7 – 10, 2014. Sundays July 27 and Aug 3, from 1:30 pm to 3:30pm. Some Bonnie Dooners who live immediately outside of the restricted area were disturbed by the increase in parking in their area during the 2013 Folk Festival. We are discussing alternatives to the current parking restriction plan with the City, seeking a balanced solution. If you have any questions, please call the City of Edmonton's citizen line 311 or contact the Bonnie Doon Community League by emailing folkfestparking@bonniedoon.ca. Thanks to everyone who took part in our survey or got in touch with us to share their views on decorative streetlights. Based on your feedback, Bonnie Doon Community League has recommended black streetlights with a fluted pole and heritage arm. The City will prepare an expression of interest for us by September 2, 2014. However, a decision on streetlights (part of Neighbourhood Renewal which is coming to Bonnie Doon beginning in 2015) is not a done deal. Fifty-one per cent of property owners must support a decision to replace the community's streetlights with ones that are black, with fluted poles and the Heritage arm. If not, Bonnie Doon will get standard streetlights as part of Neighbourhood Renewal. There is no additional cost to property owners if we go with standard streetlights. In late fall 2014 or winter 2015, the City will host a pre-construction open house to share final neighbourhood designs, inform residents and property owners of what they can expect during construction, and share information on the Local Improvement process. Visit edmonton.ca/buildinggreatneighbourhoods and click on the Bonnie Doon neighbourhood for more information. Let Darla Watch Her Son Play Soccer! This is regarding the EMSA City (July 6) & Intercity (July 19) Championships. If Bonnie Doon does not provide its quota of volunteers to help run the tournaments then EMSA will levy large fines upon us. So, if you know Darla Bodnar (the Prime Force that manages much of soccer in Bonnie Doon), you understand she will fill in where she must, even though that means she will not be able to watch her son play soccer. That's not fair! Bonnie Doon is short one volunteer for Sunday, July 6. The slot runs from 11:45 am to 4:15 pm at Millwood Park Campus (23rd Ave. & 71st St.). The position is an alternate. We are also short two field marshalls for Saturday, July 19, from 8:30 am to 1:15 pm at EMSA Park Complex (50th Street & Ellerslie Road). If you can fill one of those slots, please contact Darla at darlagbodnar@hotmail.com. Thanks!